James Divine is the visionary Chief Information and Innovation Officer and one of the founding members of Project Isizwe. James’ unquenchable thirst for all things IT and his passion for enabling WiFi as the technology for connecting the unconnected, is behind the non-profit organisation’s successful deployment of the largest public access WiFi Network on the African Continent. James began his career as a computer technician and has worked his way up through the ranks of the IT sector. 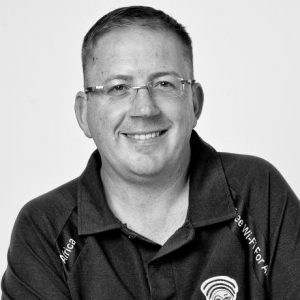 He has gained extensive experience in the telecommunications sector, including: solution architect, VAS and group IT manager (at iBurst), professional services engineer (at Systems Fusion SA), senior network and security specialist (at Intekom/TelkomSA), and helpdesk consultant and network analyst (at FirstNet). James has built a number of Internet Service Providers (ISPs) in countries like Mauritius, Uganda and South Africa. In 2015, James was named among the top 5 Visionary CIOs Awards by ITWeb for his belief in the power of technology to transform lives. James speaks at many key industry events and has a deep love for being in the field and solving interesting problems.